To celebrate the success of each of their chart-topping bands, #Westlife's Brian and Boyzone's Keith have created #Boyzlife and are set to make their debut performance in India. Percept Live, the creators of Sunburn, Asia's biggest music festival, brings down the legendary 'Boyzlife' under their Live Intellectual Property, 'FLY'. Percept Live is all geared to bring to India the much loved and very successful Brian McFadden of Westlife and the iconic and ever popular Keith Duffy of Boyzone. The boys respectively, are joining forces for a show for the very first time in India which will be held on 19th May 2018 at Mumbai and 20th May 2018 at Bengaluru. Percept Live's 'FLY' Music Festival is an International Live Music Festival cutting across multiple genres that brings together the biggest and most legendary names in the world of live music entertainment. The very first edition of 'FLY' was launched in 2015 in Mumbai and saw the iconic English singer-songwriter and musician Ed Sheeran belt out popular pop, acoustic and folk numbers to crowds that had travelled pan India to witness him live. 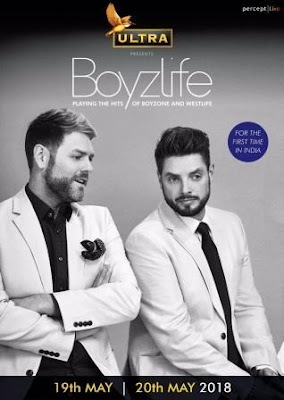 Titled as "Boyzlife Live", the concert will feature the perfect blend of the greatest hits of Boyzone and Westlife to celebrate the success of each of their chart-topping bands. During this India tour they will perform a special selection of songs from two of the most popular and loved groups of the 90s and 00s, Boyzone and Westlife. Brian McFadden's debut solo single "Real to Me" topped the charts in the UK, Ireland and across Europe, becoming one of the biggest radio airplay hits that year across the continent. He followed this up with three more solo No. 1 singles and a platinum status in Australia where he resides. Some of Westlife's chartbusting hits include "Swear It Again," "My Love," "Fool Again," "Queen of My Heart," "I Have a Dream," "Uptown Girl," "I Need You," "Soledad," "All or Nothing," and "Seasons in the Sun". Keith Duffy, on the other hand, has enjoyed success as a member of Boyzone, which was one of Europe's most successful Boybands in the 1990s and the years that followed. Some of the group's greatest hits are "No Matter What," "I Love the Way You Love Me," "Words," "Baby Can I Hold You" and "Love Me for a Reason". The Boyzlife show has already been performed for over 20,000 adoring fans since the pair came together in 2016, and will now come to India for the very first time in May 2018. With Westlife, Brian McFadden enjoyed 12 UK and Ireland number 1 hits whilst with Boyzone's Keith Duffy enjoyed similar success with five #1 albums that sold over 25 million copies worldwide. Manuj Agarwal, CEO, Percept Live said, "In 2018, Percept Live will not only deliver the best in class Music experience to our fans but also scale up in different formats in order to increase our geographical footprint and reach. We will be customizing every event pan India in such a manner that fans will get to enjoy a world class entertainment experience of all genres spanning the best artist line-ups, live percussionists, international dancers, state-of-the-art SFX, a curated F&B experience and a wide range of activities to keep them immersed and holistically entertained. The Boyzlife India Tour is our attempt to scale up in order to reach a different crowd without compromising on the experience and quality of the FLY Intellectual Property."